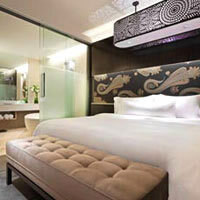 New Delhi business hotels review and boutique beds. A fun guide to the travel landscape beyond 'Delhi Belly'. Plus Gurgaon shopping malls, and spicy eats. LANDING at the Indira Gandhi International Airport’s Terminal 3, (www.newdelhiairport.in), will bring a dazed smile to your face. It could be Alice in Wonderland. Where once were bleary-eyed passengers milling about dimly-lit musty corridors at 2am, fearfully entering the Twilight Zone, are now brisk-stepping travellers enjoying 5.4 million square feet of gleaming designer space. 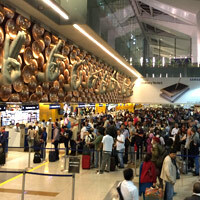 New Delhi’s T3 lays claim to be the eighth largest terminal in the world with 89 travelators, 31 escalators, a 6,400m conveyor belt to handle 12,800 bags an hour and a hi-tech baggage handling system with explosives detection technology. This is music for pin-striper ears, though the immigration hall is a tad narrow and fills up fast. Come departure time, the mystifying fuss with stamping cabin baggage tags at security has thankfully been dispensed with. The fact that airside is a sterile zone counted not a whit and passengers arriving at their distant gates sans security stamp had to trek back almost a kilometre. This is a welcome relief. Bear in mind that the security check at Delhi is one of the slowest anywhere in the world and this does, at peak times, sorely let down an otherwise decent facility. Everyone gets a pat down so brace for it - separate lines for women, of course. Water bottles - sealed or open - seem to pose no issue here. The premium lounge, shared by several airlines, is small and cramped – at times standing room only – with three alluring iMacs that are devilishly difficult to get on to as you needed to borrow the wireless keyboard, surrender your boarding pass as a security deposit, and then wrestle with log-in passwords. With your back to the seating area, everyone can then share your private, blushing Facebook moment. Access has improved modestly. The lounge food, however, is excellent with items like butter chicken, paneer masala and biryani. It can get unusually warm in summers and many prefer the food court next door with its wide selection of tasty nibbles. Enjoy Chinese noodles, a dosa, pizza at Domino's, a cup of Joe at The Coffee Bean & Tea Leaf, dinner at the Delhi Daredevils Sports Bar, a bite at bookseller WHSmith’s café, or a maharaja burger at McDonald's. There is a fair amount of open-plan seating on the upper second floor where most of the food is available. There are also laptop plug-in points aplenty. By early 2017 Delhi Bazaar had taken over most of the ground floor and the immense, comfy seating spaces had sadly disappeared leaving passengers with limited options save for the gate areas. (Or stop by Au Bon Pain.) This is definitely a minus. The 2am red-eye arrivals haven’t changed, but the interiors now spell more light, better design for traffic flow, and elbowroom, perhaps just what the men in uniform need to beam a big welcome smile at immigration. 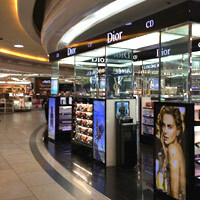 Expect expanded duty-free shopping with brands like Mango, TUMI, Victoria's Secret and Indian boutique Kimaya. There's a Guardian pharmacy and the Early Learning Centre for kids' stuff. The sprawling Delhi Duty Free shopping outlets are packed with several racks of alcohol and perfumes, as well as ayurvedic wellness products and a large range of Indian teas (pick masala chai or opt for haute Darjeeling). Duty-free prices at Delhi Airport (Indira Gandhi T3) ranged April 2017 from US$40 for a litre of Johnnie Walker Black Label, and US$40 as well for a one litre bottle of 12-year-old Chivas (no change from early 2016), to US$102 for a 50ml bottle of Dior's popular J'adore perfume. Also explore Mont Blanc, Chloe, Swarovski, and must-see Ishana (a funky Indian handicrafts store with live musicians, spicy nibbles, and a cool pool to dip your tired feet in). Ishana is a splendid browse albeit with a frustratingly slow cashier. Pick up Indian music CDs for Rs295 and and a tin of masala tea for Rs550. A small tin of masala chai at the Delhi Bazaar outlets is cheaper at Rs400. Kala Kranti’s stall, located across from Coffee Bean, is jammed with fun last-minute purchases for the ladies – from stoles and trendy jewellery to Indian-style bags and handicrafts. Potter about the well stocked WH Smith bookstores where service is fast with additional distractions on offer including Indian nibbles. CHROMA Zip from Tata serves up a broad selection of communication devices from mobile phones (largely Samsung and Nokia - Indian smartphones from Karbonn and Micromax have disappeared) to laptops. Also browse Delhi Bazaar by Craft House with nicely packaged gift items. Bored? Pilot a B737 in a flight simulator at Rs2,500 for 15 minutes, or longer. Another imaginative - and useful - Terminal Three add-on is, yes, an adjoining car park for 4,300 vehicles. Negotiate immigration, grab your bags and step into the heat and dust, well, only if you must. The Delhi Metro linking much of the capital and Gurgaon, now operates electric trains from the airport 6am to 10pm, getting you to the city centre in just 18 minutes. Welcome additions to the transport grid include EasyCabs (www.easycabs.com) and on-call Meru Cabs (tel: 91-4422-4422, www.merucabs.com). Masochists and romantic tightwads can still avail of the yellow-and-black Delhi taxis and other transport options. Sometimes the black-and-yellow though are the only option with big queues for the call cabs. They are rickety but dependable and cheaper. A 40-minute to one-hour journey from the airport to the Delhi’s city centre will be around Rs400 by local taxi, plus charges for luggage – usually around Rs20 a piece (exchange rate US$1=70 Indian rupees). Find Meru's ticketing table outside near a kerbside pillar and not at the indoor counter. These cabs cost upwards of Rs600 from airport to downtown including surcharges. Tips are optional but outstretched palms and heart-rending stories are to be expected. Safe they might be but the yellow and black taxis, normally Maruti Suzuki vans or lumbering Ambassadors, are not always air-conditioned. If this sounds alarming, there are other, more expensive, rental options. Make sure the meter is turned on as you get in. The flagfall for taxis is Rs20 for the first kilometre (Rs11 for non-AC taxis, and Rs13 for AC-equipped cabs for every kilometre travelled after that) and for autos, Rs19 for the first two kilometres. While taxis are supposed to charge according to the meter this is, of course, an aspirational, rather than actualised, ideal. Taxi meters, mysteriously covered in towels, are invariably out of order, or set to whirr at Olympian speeds in no relation to distance, speed, time or any other sensible yardstick you might think of. Then there are the surcharges, with complex calculations, tabled in well-thumbed charts. 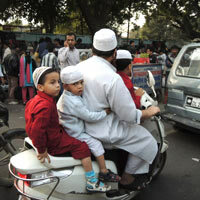 The three-wheeler autos, or scooties for the die-hard “Delhi-wallahs”, offer a darting rollercoaster ride ending with the usual all out haggling. Our advice? Surrender to India. Toss your watch (you won’t be needing it here), lie back and enjoy things. Do it India style and the journey will be fun, full of surprises and even the odd, fully-revealed taxi meter – that actually works. Check out the Delhi Traffic Police’s website for more details (www.delhitrafficpolice.nic.in), or find them on Facebook for additional information. Delhi is awash with hotels to suit all budgets and tastes. And they are always full. From dodgy backpacker hotels in grungy Daryaganj or Paharganj where rooms may be available for US$5 and not-too-pinching New Delhi guesthouses, to brisk New Delhi business hotels like The Oberoi (closed for a makeover) or Taj Mahal, and the spacious suites of the ultra exclusive Trident in Gurgaon (almost a suburb of the capital now), a whole range of rooms is available. Expect houseful signs and exorbitant prices. Here, US$300 might be considered a steal. All New Delhi hotels have become non-smoking due to a government ban. A few designated smoking rooms are still available on request, and many top-drawer hotel bars still keep a designated smoking room. Credit cards are accepted at all establishments, except perhaps at shifty Daryaganj dives, otherwise ATMs are conveniently located. When room rates or any facility like the internet is being quoted remember it is without the luxury tax, which in Delhi is a crunching 12.5 percent. Hotels in neighbouring Gurgaon have started charging luxury tax to reflect government norms as well, although at a slightly lower 10 percent. Noida is the other Delhi satellite. With an F1 racetrack it is now officially on the Formula One Grand Prix calendar. Although top end hotels are fairly evenly distributed all over the city, Central and South Delhi hotels are much the rage. 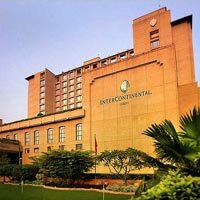 This is also where most of the best New Delhi hotels are located and for the purposes of this hotel review we’ll start at the centre. In a major departure from its luxury resort mould, top-end Aman Resorts brings something entirely new to the table in Delhi. 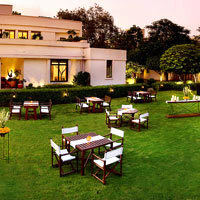 Well established in the premium range is The Oberoi New Delhi. In 2017 the hotel closed for a complete overhaul to return comprehensively upgraded and gussied up by early 2018 with 220 rooms retailing from US$400 or so. Part of a very efficiently-run international chain, the seven-storey hotel overlooking Delhi’s spiffy, 19-hole golf course brings with it oodles of pedigree along with a stupendous location. Built in 1965 the hotel is considered a Delhi classic, and you’ll frequently spot celebrities and VIPs strolling through the lobby. The shopping arcade offers premium designer brands that will empty your wallet quickly enough. And for a sumptuous repast in chic surrounds, there is the excellent buffet at threesixty, which remains in the new incarnation of The Oberoi New Delhi. To burn off calories check out the new spa, a fitness centre or the alfresco pool that returning guests will remember. There is a heated indoor pool as well for cold winters. Deluxe rooms faced the pool while premium rooms either look across to the golf course or the magnificent 17th century Humayun’s Tomb. 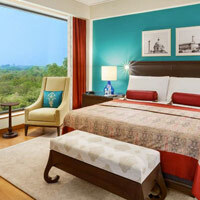 Suites at this top New Delhi business hotel offer smart teakwood floors, see-through glass partitions for bathrooms, old-fashioned work desks, cobalt blown glass bed lamps, maroon bedspreads, flashes of turquoise or teal wall, flatscreen TVs, complimentary WiFi and 24-hour butlers. The feel is contemporary and clean with enough colour pop to remind you this is India. 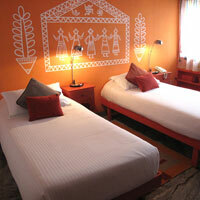 The more laid back sister hotel Maidens is in clamorous Old Delhi, now more easily accessed via a new outer Ring Road. The Lodhi (1 February, 2013) took over from Aman New Delhi as a luxury boutique hotel to rekindle the travel urges of the jaded jet-set. Inward looking, meditative almost, with lattice work filigree casting shadows across quiet colonnaded corridors well removed from the heat and dust outside, this address offers 40 unobtrusively elegant rooms (and 28 apartments), some with a 32sq m pool within a small private garden or set in a breezy glassed-in verandah-facing alcove. Pick from a Lodhi Room, a Lodhi Premier, or rocket up to a Lodhi Premier Suite with 2,250sq ft of stretch space. Swing an elephant by the tail here if you so wish, a novel pastime for a hotel but a grandly Indian way of checking things out should the muscles - and concierge - oblige. There is no clutter. Rooms look inward onto a green central courtyard lawn and a hideaway sunken pool, and offer a combined bedroom and living room with a twin-vanity dressing area. While decor is muted throughout with most rooms offering a very similar feel and finish, the earlier understatement and limited palette with its brooding dark wood has been replaced by blue and green powder pastels, textured cream walls, revolving art exhibits, brighter cushions and bed runners. These touches have made The Lodhi more cheery and welcoming, homey if you will, with a wonderfully informative and engaging husband and wife team in charge to complete the ensemble. The piped music is sufficiently chilled out to have suited or saree-draped hips swaying in rhythm. The Premier Suite serves up the customary cool Rajasthani grey stone underfoot with its raw, if well polished, finish, rugs to make the space more homey, three flat-screen televisions, twin vanities, a power shower cubicle and a soaking tub. A second bedroom offers a separate bathroom. The small dip pool is heated. WiFi is free not just here but throughout the hotel. A small step for a luxury hotel and a giant leap for mankind. A Lodhi Premier room is not much smaller at 1,350sq ft with the same tasteful decor. In-room safes are the old-fashiooned variety - more for jewellery than a notebook. The building facade is simple beige stone with sharp, clean lines. It catches the light and changes tones with the rising and setting sun. A lone elephant statue welcomes visitors at the porch. The retro-chic boneshaker Ambassador cars of yore have been replaced by modern wheels that will not break down en route. Step in to the hotel and, perhaps disconcertingly for some, there is no busy lobby resounding with the clatter of high heels. The entrance flows into the living room, which in turn flows into the reception area and so on. You define your space and use it as you might at a resort, or at a friend's home. There is no in-your-face demarcation. There is no huge conference area, and no gilded ballroom (though there is a 50-vehicle car park). This is a place for quiet contemplation, a large book, and a luxurious unwind at wallet-exercising prices. Find a spa, a gym, a cigar lounge and enough art to marvel at through any quiet afternoon. For the modestly boisterous or those in search of calories, there's the Andira nightclub, OTW (on the water) for Asian and Middle Eastern fare, Elan, and a pool cafe "below decks" along the long open-top pool. A 10-minute walk from lively Khan Market, where bookshops, boutiques and flower shops compete with provision stores, is the Taj Mahal Hotel New Delhi on tree-lined Mansingh Road. Part of the slick, fast-expanding Taj group, the hotel has provided the backdrop to many Bollywood Hindi films. Lemon essence is a signature scent that wafts throughout the property. The lobby has long been a popular “Delhi-ite” hangout with its marble filigree and ceiling cupolas decorated with enamelled inlay. It is a splendid introduction to India with many Mughal touches like the marble filigree balustrades. A modern, somewhat off-kilter, counterpoint is provided by the large fountain with a giant marble orb at its centre. Just off the lobby are some of Delhi’s acclaimed signature restaurants – House of Ming, specialising in palate-tingling Szechuan cuisine, Wasabi with contemporary Japanese, and the Machan, the 24-hour coffee shop known for its desserts like Bulls Eye (a sinful mélange of ice-cream, and warm chocolate cake doused with a bitter chocolate sauce) as well as its ‘falooda’ Indian milkshakes. Eat under the watchful gaze of Indian tigers, leopards and gazelles painted on the walls. Machan is a convivial spot for all day meets, homey yet smart and bustling. Built in 1978, this 12-storey business hotel has over the years assumed an iconic status with excellent service and a great location in a leafy residential area well located for access to business districts, bustling markets, and the airport. All rooms serve up a grand view, the terrace-facing deluxe option overlooking a grassed terrace dotted with Alstonia trees. Armchairs in the room come with a handy footstool to rest weary legs. Most deluxe rooms have king-size beds though a queen is available on request. There’s also an elaborate pillow menu available at just the touch of a button. A standard size safe is available in all rooms and, for extra storage, the lobby manager can provide more locker space at a charge. Higher up the scale, the Club Rooms for jet-setting business travellers offer the same space but more freebies: two-way airport transfers, round-the-clock access to the gym facilities and Club lounge with its private meeting areas, complimentary in-room bottle of imported wine, chocolates and fruits, breakfast buffet, all day coffee and tea service and complimentary drinks during happy hours. Ask about the 24-hour butler service and early check-in, late check-out options. Club floor rooms have been specially designed and set up for single women travellers too. Security cameras outside the door enable women guests to see their visitors on their hotel telephones and, perhaps, to turn them away if they are not good looking enough. Club Rooms run from the seventh to eleventh floors with the views improving as you climb higher above the green tree-lined avenues, looking down on a magnificent open-air pool. The rooms are traditional in design with a wooden headboard. Expect a black-marble-top desk, flat-screen TV (DVD on request), a camera-size safe, and a somewhat compact toilet with weighing scales to take your mind off encroaching walls. The ensemble is compact, unfussy and will please corporate sensibilities. Room furnishings and fabrics come in burgundy, blue, gold and even orange. Wi-Fi and Broadband access is charged but road warriors get 40-minutes free on house computers in the Club Lounge. Next up on the ladder, Executive Balcony Suites are comparable to Club Rooms but offer a more spacious 778sq ft. If you want lavish, then the Grand Presidential Suite overlooking India Gate and Rashtrapati Bhavan (the Presidential Palace), fits the bill. The Taj is a fine downtown garden area New Delhi business hotel with high standards and excellent service. Step in and hotel staff will swarm to do your bidding. The city’s undisputed jewel in the crown is the majestic The Imperial, New Delhi. Centrally located near Connaught Place on Janpath, the prime Delhi shopping strip where huge Metro Railway digging is been underway – and adjacent to the government-run Cottage Emporium – the hotel was built in 1936. Dilapidated Raj has given way to colonial chic infused with mod statements, including stunning flower arrangements in the lobby and beaming doorwomen. Award-winning restaurants like Spice Route and the 1911 Bar (giddily festooned with illustrations and pen drawings that conjure up historic battles) add to the hotel’s appeal. For history seekers, The Imperial is also home to Patiala Peg – the bar in which Jawaharlal Nehru, Mahatma Gandhi, Mohammed Ali Jinnah and Lord Mountbatten met once to discuss India’s independence from Britain and the birth of Pakistan. This 233-room Delhi heritage hotel set in verdant grounds doubles easily as a business address and offers huge dollops of history. The old high-ceiling rooms built at a more gracious time, remain, along with the colonial décor, now substantially spruced up. Towels and sheets are monogrammed with the hotel’s insignia given by the British to the family, who owned the hotel. Good-size standard rooms come with names like Heritage and Imperial and the best views open out poolside. With basic rooms starting at US$273 + plus taxes, rates are comparatively high but the maxim, “you get what you pay for” holds particularly true here. Hugely popular is the Eliza Room line, specifically designed with the safety and comfort of single female travellers in mind. Features include cameras outside the room to screen access, round-the-clock service by female staff, and special bathroom amenities for women. 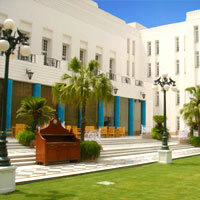 The hotel has also added two brand new facilities to its list in recent years. The first is a Health and Racquet Club, opened in 2010, featuring its own squash court, personal trainers, complimentary yoga classes and state-of-the-art Techno Gym equipment. The other is the long-awaited Imperial Spa, which boasts over 16,000sq ft of space and serves up a varied menu of ayurvedic and western treatments – it is available only to hotel guests. The Imperial Spa is one of the largest in the city and sports a Moroccan-Moghul mix of motifs and style. Think arches, slender marble pillars and stone-inlay work in the walls. Relax and soak in the atmosphere while getting a massage, scrub or wrap in a therapeutic treatment suite, then mosey over to the sauna and steam room or take a dip in the Jacuzzi. It’s easy to see why The Imperial is often called a hotel museum. Its corridors, which double as art galleries, are lined with original watercolours and oils, while 17th and 18th century antiques dot the public spaces. A daily hotel tour details the Imperial’s many, many hidden artefacts and treasures, some of which you will happily trip over during any casual walkabout. The hotel boasts a chic Chanel store, and the in-house boutique is also quite popular with a beautiful selection of pashmina shawls and Indian leather accessories. Close by is Shangri-La's – Eros Hotel, New Delhi, run by the Hong Kong-based chain. A spacious lobby is lit by three huge chandeliers and further embellished with a plasma TV. This relatively younger kid on the block is all spit and polish and gleams with self-confidence. Its well-polished granite floors might be a challenge for those in overly tall stilettos. Positioned as a prime downtown business hotel, the Shangri-La attracts a fair bit of custom from Southeast Asia and Australia. All its rooms are road facing and the higher up you go the more likely you are to spot Delhi’s enduring monuments and landmarks like India Gate, Rashtrapati Bhavan and Parliament House. This location is pretty much at the heart of Sir Edward Lutyens’ Delhi where roundabouts (not traffic lights) regulate traffic along broad tree-lined radial avenues. This is the part of town where Delhi as a garden city is best enjoyed. The Shangri-La offers its own garden with shaded trees and outdoor pool where you can enjoy a bite alfresco before the sun beats down in earnest. Of course, should you wish to catch the rays, stretch out at the pool. For a dash of high culture step into the hotel’s private art gallery, Art 19. Later, retire to the spa for a rubdown or customised treatment. 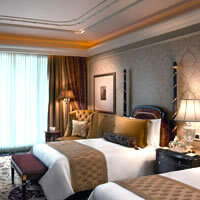 For big-boned westerners the Shangri-La’s superior rooms might be a tad snug but are very comfortable nevertheless. A floor-to-ceiling glass wall separates the bedroom from the bath and a screen can be rolled down if you insist on being coy. Every room comes with a copy of the book, Shangri-La, after which the chain has been named. All rooms feature complimentary WiFi, LCD TV, speakers in the bathroom, and, a useful touch, ironing board and iron. Guests on Horizon Club floors get complimentary ironing of two items of clothing every day. Besides the usual facilities, the business centre provides conference rooms, translation and interpretation services and even prints business cards. The concierge department has been known to go out of its way to procure working SIM cards for business guests. The hotel boasts some trendy restaurants with international cuisine, and the breakfast spread is popular. This is a brisk, centrally-located Delhi business hotel, but it doesn’t quite stack up with the expected Shangri-La standards. 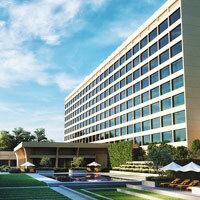 Across the roundabout from the Shangri-La, Starwood’s Le Meridien New Delhi was built for the Asian games in 1982. That was quite a while back. The hotel has undergone several refurbishments and still sports a jaunty stride. The lobby has been transformed into an all-white modern marble affair, with several plasma TVs providing entertainment for lobby loungers. A tall glass pillar backs the futuristic reception area lending the place a minimalist space age feel. Walk on past the chic curved wood-pillar The One bar to the soaring atrium. Bubble lifts whisk you up to orange candy-stripe carpet corridors. 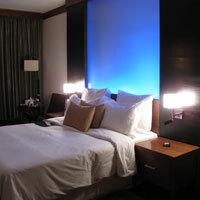 The renovated Club Rooms come with a mood light panel behind the headboard. Expect dark wood panels and sideboard, large flat-screen TV, iHome dock, and WiFi and Broadband, which is charged though access is free in the Club Lounge. There is a black leather easy chair and, by the desk, a single three-pin multi-plug socket. A flat laptop-friendly safe will please business travellers and the mosaic floor in the bathroom makes for a change from the de rigueur marble. Some bathrooms feature a tub while others offer a shower cubicle, so do check. The hotel comes up trumps for disabled guests. There are ramps everywhere and bathrooms are equipped for the handicapped. The hotel also offers cribs on request and babysitting services for a fee, for parents who want a quiet night out sans typhoon tykes. The Lalit New Delhi (formerly InterContinental, The Grand New Delhi) is perched on the fringe of Connaught Place, the heart of town. The revamped hotel lobby is an airy and minimalist four-floor atrium with clean lines and open space presided over by a dominating Hussein canvas and a "nandi" bull bronze by Satish Gujral. But despite its artistic flair, the hotel lacks the oomph of its five-star competitors. The lobby leads into the all-day 24/7 restaurant – with a fabulous outdoor patio overlooked by only sky – and a chic bar where you might try a Lalit Cocktail. 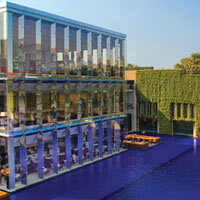 The Lalit is close to offices as well as some of the best New Delhi shopping. Rooms feature blonde-wood doors, timber flooring, plump beds, 42-inch flat-screen TV, DVD player, a long work desk with two multi-pin sockets, WiFi, and an ergonomic stress-relieving chair. A see-through glass partition (with shades) separates the bathroom area with separate shower and soaking tub. Expect an iron and ironing board, two 500ml bottles of complimentary mineral water and ample space to swing your briefcase about. Corporate guests may enjoy the Luxury rooms, set on higher floors for stellar views. A Luxury room comes with roundtrip airport transfers, breakfast and brisk Club facilities. Other features include an outdoor pool, and a Rejuve spa for tired limbs. All in this is a dramatically reborn New Delhi business hotel that will double equally comfortably for leisure trippers. Head downstairs to find the psychedelic and somewhat bling Kitty Su nightclub, which opened in 2011, and surprisingly still requires advance booking. Or, face the lineup of Delhi young-things ready to spend an arm and a leg whilst bopping to the club’s signature electronic music. Keep an eye out for sister hotel, The Lalit Noida, a 250-room upmarket 5-star property in the pipeline. The white-washed old world The Claridges New Delhi occupies a corner garden plot not far from the Taj Mahal New Delhi and it is very popular with journalists and Western visitors. The elegant hotel has gone through several useful renovations and offers modern service and amenities in a low-rise residential-style building that offers great atmosphere, not to mention alfresco tea on the lawns. Popular Indian restaurant, Dhaba, has been a Delhi mainstay for years, and The Tandoor knocks out good kebabs. Claridges offers conference facilities and function areas seating up to 200, and a modern business centre. Expect attentive service in an informal setting. All rooms have interactive plasma TVs, DVD and WiFi, along with a pillow menu. The Claridges recently introduced its loyalty programme, The Claridges Club, offering members various discounts and privileges. The chain has recently opened The Claridges Surajkund, replete with a swanky 15,500sq ft spa, as well as The Atrium, a business hotel located between Delhi and Faridabad. Vivanta by Taj – Ambassador, New Delhi (formerly The Ambassador Hotel) re-opened in 2011 under the Taj Group as a business traveller address. Housed in a colonial-style heritage building, the hotel’s white-washed walls give way to a clean and cheerful inside. This is a classic executive choice – down to the specially designed express spa treatments. Culinary offerings are standard – Chinese and Indian – but two special experiences are available on request: ”Private Soiree” – a five course alfresco meal served on the fourth-floor terrace at about Rs3,500 for two; and the “Chef’s Table” at Larry’s China, which serves small parties of up to 10. Guest rooms are slightly larger here than in neighbouring properties, and the high ceilings, typical of Old World Delhi, add to the feeling of space. There’s an LCD TV in all rooms, but WiFi, comes with a charge. The Park New Delhi (a member of “design hotels”) is smack in the middle of town on Parliament Street, close to Connaught Place and overlooking the historic observatory Jantar Mantar. It occupies an unassuming white-washed building that is easy to miss. Step inside though and the place is transformed, with mood lighting, Arabian-nights glass-bead curtains, cool lounges, and bright splashes of colour. The hotel offers 132 rooms in the main building, all with king-sized beds, and a two-floor ”Residence” super luxury section that offers 16 deluxe suites and a presidential suite. On the Residence floors, rooms come with a Jacuzzi bathtub, LCD TV, iPod docking, 24-hour butler, access to a private meeting room and entry to the Club Lounge, including free breakfast, private dining options and free happy hour offerings. The hotel offers free airport transfers and babysitters on demand. The hotel will be happy to provide an iPod upon request. Twenty-four-hour dining is on offer at MIST, a private swimming pool is at hand, and to work off the day’s stress, there’s The Spa with sauna, steam room and massage. For a big night out, grab a bite at the award-winning Fire Restaurant, and then head to Agni Bar for some late night grooving or, alternatively, to the attractive poolside lounge bar Aqua, for a laid back drink and relaxed DJ rhythms as the sun sets. Much thought has gone into the design concept. Overall the hotel is light and airy, but it has no doubt seen better days. 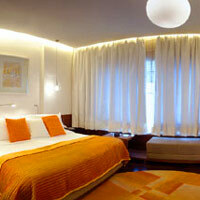 Many guests choose to reside here purely for the Connaught Place location. Close by is the newly opened Radisson Blu Marina Hotel Connaught Place, heralded as the city’s first “heritage boutique” city centre hotel. The only upscale offering in Connaught Circus (Rajiv Chowk), this 90-room hotel’s attraction lies in its central location and close proximity to an Airport Express Line Metro Station and New Delhi Railway Station. Don’t let the historical exterior fool you, the interior is surprisingly modern in a sleek, minimalist way. Superior rooms have their own private terrace, while the Radisson Club floor with its 38 rooms and three suites offers perks for business travellers such as 50 percent off in-room on WiFi usage and access to the Club Lounge where free breakfast, Internet, and evening cocktails are on tap. Make sure to stop by the Great Kabab Factory to sample over a hundred types of kebab. In the central Connaught Place area, the city’s shopping and business hub, the eco-friendly Metropolitan Hotel, New Delhi, (also dubbed The MET), offers 185 rooms and suites, the NeoVeda Spa, and a variety of eateries including Sakura, which is popular with the expat Japanese. It is also home to luxury lifestyle store Craft House, and offers a variety of event spaces, including an outdoor garden. Top-drawer Delhi conference hotels, closer to the city’s diplomatic areas and the airport, along Sardar Patel Marg, include the sophisticated ITC Maurya New Delhi (now part of the Starwood "Luxury Collection" and no longer carrying the Sheraton mark) and the neighbouring Taj Palace Hotel, New Delhi. From US Presidents to French Prime Ministers and the King of Saudi Arabia, nearly all visiting heads of state have stayed at the Maurya, probably at some inconvenience to other guests. Billed as one of the best Delhi business hotels, different room categories include the Executive Club, Towers, Mauryan Chamber’s Luxury rooms and ITC one, the hotel’s premium offering. Enter the main lobby and you are under the Indian version of the Sistine Chapel. When the hotel was launched it commissioned well-known artist Kishen Khanna to paint scenes from Indian village life on its domed ceiling. Look carefully and you can see a cow being scrubbed with what looks like a loofa, wandering mendicants and doe-eyed village women. Stained glass panels painted by India’s foremost rebel artist, MF Hussain, ring the outer windows. The Executive Club offers the most economical rooms, where the basic rate starts at US$330 or so, and includes modern communication facilities, complimentary Health Club usage, access to the business centre and Club Lounge. Best views overlook the garden and pool the worst, the hotel’s engineering plant. Standard rooms are not cramped at all and come with a bathtub. The more spacious Luxury rooms come with 42-inch plasma TVs and king-size beds. The hotel has a well-equipped health club and now has its own spa, Kaya Kalp, offering both traditional Indian treatments as well as western massages. It also boasts a variety of event spaces, including the Nandiya Gardens for an outdoor event. Apart from its VIP clientele, perhaps the Maurya’s most well known asset is the Bukhara restaurant which has become a landmark in Delhi serving traditional north Indian cuisine including kebabs that melt in your mouth. Reservations are recommended. Or try the excellent Dumpukht, featuring steamed nawabi cuisine, kebabs and biryani. Next door is the 441-room Taj Palace Hotel, New Delhi. Built in 1987, its expansive white marble lobby offers intimate spaces like the cosy Tea Lounge where you can sample 32 different kinds of leaf. This Taj is one of the best New Delhi conference hotels with a staggering 40,000sq feet at your disposal, indoor and outdoors, for a CEO chinwag, big banquet or wedding. Expect a mix of taupe tones, cool marble and exotic amber-hued woods. There are 13 halls of various sizes, the largest of which comfortably fits 1,000 guests. The convention centre offers simultaneous translation facilities. You can also rent out one of two lawns for private functions of up to 500 people. The Taj Palace caters largely to business delegations, which explains the option to borrow laptops and printers and full WiFi coverage. A minor niggle: mobile phone signals can be a bit patchy. 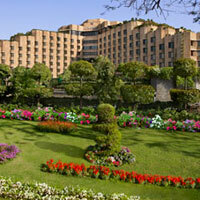 The Taj Palace also provides video conference facilities, tennis courts and a nine-hole putting green. All rooms are either city or pool facing. Refurbished Deluxe rooms are favoured. The more luxurious Taj Club Rooms come with complimentary imported wine, airport transfers, breakfast, tea and coffee at the Club Lounge, cocktail hour and private check-in, as do the 40 suites. For environmentally conscious guests, the hotel now offers special “Green Rooms” designed to increase sustainability and reduce waste. Spread over six acres the hotel is known for its eateries like the train carriage Orient Express, where a meal for two with drinks will set you back roughly Rs5,000. 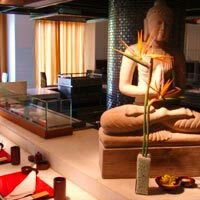 There’s also Blue Ginger, a contemporary Vietnamese restaurant that’s popular among the South Delhi crowd. It’s not cheap, though – a cheque for two will set you back about Rs4,000. More economical is the popular Masala Art, which serves fusion Indian food, sometimes cooked in olive oil and probably the only food outlet in Delhi that serves sanitised sugar cane juice. Looking to relax? No problem! The hotel also serves up an outdoor pool, fitness centre, spa, salon and shopping arcade. The government-run pink-sandstone The Ashok in the heart of the green diplomatic enclave has more competitive rates. With 550 rooms it’s easily the capital’s biggest property and is a popular Delhi conference and meetings hotel. Another claim to fame is its convention hall, one of the largest in India. 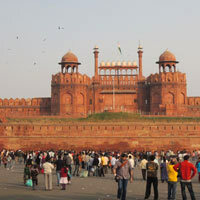 The Ashok is a landmark building and not only for its distinctive sandstone exterior (mimicking the famous Red Fort). Not in the same league as other business hotels, periodic attempts have been made to revive this slightly dull historic hotel. A variety of restaurants can be found here, like Mashrabiya, which serves Lebanese cuisine paired with a selection of flavoured sheesha hookahs. Meat-averse patrons can head to Sagar Ratna, serving purely South Indian vegetarian dishes. The 12 eateries dotting the complex leaves you rather spoilt for choice. But it is Amatrra, its charming lifestyle spa, which is the hotel’s inspiration. Techno-gym equipment, Vichy showers, yoga classes and an automatic shampooing machine are all on offer here. Opened in 2010, The Leela Palace New Delhi, has brought a generous dollop of high-end style to the laundered and leafy Diplomatic Enclave with its eco-friendly philosophy, brisk service, detailed finish on everything from wood carvings and fabric selection to floor inlays, and hi-tech amenities to keep suits smiling well into their late-night confabulations. The marbled lobby is a colonial throwback with soaring white columns, expansive windows welcoming of light and draped in tall silk, deep seating sofas, and gracious chandeliers. The regal flourishes are well edited, providing a sense of India at every turn without going overboard. And crowning this confection is a glorious rooftop infinity pool - temperature controlled of course - with a vertical wall at one end, breezy cabanas along the side to catch the rays, and two gilded cupolas. Leela’s spacious 260 rooms all feature hi-tech amenities. A 52sq m Royal Club room serves up cool dark wood flooring with marble in the foyer, patterned carpets, gold-hued pillows, flat screen television, a mustard sofa next to an ornate wooden working desk with elaborate mother-of-pearl inlay and two hidden three-pin multi-plug sockets. This space has a plush classical feel. The bathroom is entirely spoiling with a soaking tub facing an in-mirror LCD TV with mood lighting at hand, a speaker phone, rain shower and Asprey toiletries. A lavish, dark and woody Royal Club reception and lounge pours on drinks and eats while two sets of elevators - also with marble inlay floors - whoosh guests up and down ensuring despite high occupancies and loads of visiting dignitaries burdened by protocol and security, room access is rarely tedious. A Grand Deluxe room is of similar size to the Club with a very similar make-up. Expect generous windows with lots of natural light, a russet headboard, white lampshades, and three-pin multi-plug sockets on either side of the bed for all charging needs. In place of the sofa, spot a high-back reading chair in brown velvet. For CEO chinwags there's the Chairman's Boardroom with puckered leather chairs. Sample one of the meetings rooms or move on up to the Grand Ballroom. Later, unwind at the spa by ESPA, gym, or imbibe well crafted guilt-free calories at one of the excellent restaurants, including the signature Jamavar for Indian morsels. Also check out the modestly younger Leela Palace in Gurgaon. The Shervani New Delhi is in the residential heartland of Sundar Nagar near the exhibition grounds, the Old Fort and a bustling shopping market. 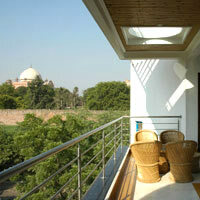 The converted residence is positioned as a New Delhi business-boutique hotel. Enjoy high ceilings, a terrace with treetop views, WiFi connection, a business centre, a small gym and a travel desk for your tourist urges. Standard rooms might be a tad too cosy, so opt for the premium rooms if you can spare the change. Farther south, you will find sister hotel Shervani Nehru Place, which offers similar amenities. The 228-room Hilton New Delhi/Janakpuri (opened late 2010) is the first international brand to open its doors in West Delhi. Located close to the Janakpuri West Metro station, getting to the city centre is a snip. All rooms come with the usual amenities, and also feature ergonomic work chairs, and rain showers in the bathroom. The 65 Executive Club rooms provide extra benefits such as complimentary daily breakfasts and free refreshments at the Executive Lounge. The Hyatt Regency lies equidistant from central New Delhi and the airport. A two-acre property with 517 rooms and suites, its bustling lobby gives a sense of the kind of hotel it is: functional if not fancy, with a clean marble décor reflecting an emphasis on service rather than opulence. Black and white photographs of India taken by a peripatetic former general manager, Peter Fulton, garnish the walls. Hyatt offers a rate of the day depending on its occupancy. Rooms face the insanely busy Ring Road or the quieter pool and green lawns, and are priced accordingly. Though it might appear that the blare of traffic would seep into the rooms, nothing passes through the double glaze windows. Rest or work in silence. Club Floor rooms come with extra amenities – use of available boardroom, free WiFi, access to the club lounge, breakfast, free drinks in the evening, and airport transfer. Suites have highly polished wooden floors, washrooms with double glass washbasins, and are large enough to accommodate a wardrobe and luggage rack. Business related facilities include video-conferencing facilities, interpreters, and even information on local banking, commerce and finance. La Piazza, Hyatt’s popular Italian restaurant, has been eclipsed by the pretty authentic Cantonese restaurant, The China Kitchen. Other eateries include a 24-hour café, Sidewalk – one of Delhi’s top-tier bakeries – and TK’s Oriental Grill. For some pampering, step into the luxurious Club Olympus Spa and Fitness Centre, replete with tennis courts and coaches, a gym, massages, saunas, a steam room and a beauty salon. 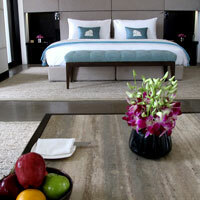 This is a well positioned address with good service among top-tier New Delhi business hotels. And for those hoping for a taste of romance, Indian style, the place serves up a procession of marriages and first-dates in every corner. Farther south, close to the Qutab Industrial area, is the 96-room Clarion Collection by Choice Hotels (formerly the Qutab Hotel) with express check-in and check-out, business centre, satellite TV, WiFi, 24-hour room service, children’s facilities, swimming pool, health club and bicycles should you wish to limber up. Executive Rooms come with complimentary, roundtrip airport transfers. Those looking for New Delhi long-stay hotels will be happy to know the Clarion Collection also offers 30 serviced apartments. In a rush? Hook yourself up through the hotel with a small private plane through aviation charter company, Air Car. Eros Hotel Nehru Place (formerly InterContinental) is a 217-room five-star hotel in a busy South Delhi suburb, most recently renovated in 2009. The hotel offers executive rooms with the usual frills - satellite TV, coffee-making facilities, a dedicated lounge, high-speed Internet, in-room safe, iron and ironing board, weighing scales for the finicky and an endless stream of complimentary drinks and snacks on the outdoor terrace garden. Work out at the gym with aerobics or yoga while your kids snack on a kids’ menu. Alternatively pop into the spa, or try the nine-hole putting green. This hotel is positioned well for conferences and offers eight meeting rooms, the largest of which claims to be the city’s second largest ballroom, with a capacity of 850 people reception style. Looking for fancy equipment to wow the boss with your presentation? No problem. Check out the DVD player, flip charts, LCD projector, stage lights, and 35mm slide projector. The Suryaa New Delhi (previously the Crowne Plaza Hotel Delhi) is farther south in the more residential New Friends Colony with easier access to the Okhla and Noida export processing zones. The hotel also offers fast getaways for Agra day-trips if you fancy taking in the Taj Mahal, but keep in mind that the monument is closed on Fridays. The 242-room hotel offers 82 Club rooms all with 42-inch flat-screen plasma televisions and a Club Lounge. Expect suites, with living room, roundtrip airport transfers, breakfast, high tea, fruit basket and wine bottle on arrival, cocktails during Lounge happy hours and DVDs on request. The Suryaa New Delhi offers “medical tourism” packages exploiting its proximity to Apollo Hospital and the Escorts Heart Institute and also provides six rooms fully equipped to cater for disabled guests. All rooms and public areas offer WiFi. Business centre and dining options are available through the day. Be sure to check out the panoramic views across Delhi from the hotel’s rooftop restaurant, Sampan. The Manor, a chic and friendly, two-storey 15-suite residential establishment in the leafy South Delhi suburb of Friends Colony is popular with Japanese guests. Dating back to the 1950s, the property offers gardens, open space, Kama Ayurveda toiletries, and Indian Accent, a hugely popular contemporary Indian restaurant. If you don’t want to grab a bite, sit out on the atmospheric verandah and have a quiet drink in the shade of two silver "diya trees of life". If you want an unhurried atmosphere away from the bustle of downtown, and attentive service, this could be the place for you. With a prime location in the new complex of hotels and offices close by Terminal 3 and the domestic airport, Andaz Delhi (2018) is a fine new addition to this crop of airport hotels. The 401 neat, sparse and woody rooms and suites include a substantial number of serviced apartments, an unusual but useful mix for business as well as long-stay travellers to New Delhi and Gurgaon. Also find almost 40,000sq ft of meetings and event space, a spa, complimentary WiFi, and a club for fine nibbles and entertainment. the JW Marriott Hotel New Delhi Aerocity (opened late 2013), is a good business traveller choice and not just for its brisk service and contemporary beige marble finish. This JW offers a MICE venue close to the airport as well as breakout spaces for small corporate meetings. Think a 12,000sq ft pillarless ballroom and 600sq ft of pre-function space. This is a cool, uncluttered cubist construct with clean lines, beaten copper art and a striking swirling "DNA strand" constructed from 38,000 glass strips, corkscrewing high above the lobby above the pastel green furniture. The hotel mixes in marble floors with dark timber (as in the lobby) to create a residential feel - and successfully. Rooms offer marble foyers giving way to dark wood flooring in the main bedroom with a carpet. Expect a laptop-friendly safe, a classic leather case - mimicking travel bags of yore - for storage, a light pinewood table with dataport (HDMI and two three-pin multi-plug power sockets), a 40-inch flat-screen TV set in deep chocolate mahogany veneer, DVD player, champagne fabric headboard for the beds, iPod dock, pastel bed runners, a small window-side divan, and simple one-press light switches. Pale pine walls and a large glass frontage make the rooms welcoming of light. Find mother-of-pearl cabinets, a smart bathing area with Aromatherapy Associates toiletries, rain shower, and a soaking tub that is partially visible from the bedroom with blinds for privacy. The wall mirror lights are bright and a vanity mirror completes the ensemble. A Corner Suite is pretty spacious at 84sq m with a wraparound design and a Jacuzzi set against the window (not much view of course but it's the thought that counts). Small but sharp pipe reading lights ensure bedtime reading will not kill your vision. Apres-work check out the Quan Spa for massage and wellness workouts. WiFi is charged, alas, but for a New Delhi airport hotels choice, JW is a smart choice. The Aerocity complex (with a Metro Station at hand and other hotel chains like Lemon Tree, Novotel, Holiday Inn, and Ibis) was somewhat delayed due airport restrictions on "line of sight" violations, a seemingly pointless issue given planes are visible from several spots along the flight path, but extended screening walls and the like have sorted matters to bureaucratic satisfaction. Not far from the international airport and a short cross-border hop from Gurgaon lies the designer sanctuary retreat of The Roseate New Delhi (formerly Dusit Devarana New Delhi), a bold yet understated development with just 50 rooms set in a tranquil garden estate far removed from the hullabaloo of the city and the bustle of an arterial national highway. 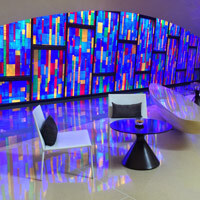 The hotel is reticent in the extreme, tucked away behind an unassuming hedgerow on a highway slip road, yielding its aubergine secrets literally step by step as you wander into the minimalist shell-interior to make your way down the smooth cream terrazzo curves to confront the purple stained glass reception. Of course, attentive staff will have zeroed in on you long before and ushered you through all the 'secret' passages. Or you could descend to the courtyard level in a beaten copper elevator. The design employs Mughal domes, scented gardens, massive unadorned stone walls, soaring wooden columns, and soothing water features to create a sense of fantasy and escape in a minimalist setting that may alarm those more used to Shangri-La bling. The many black and cobalt pools with stepping stone walkways pose a challenge for high heels and the elderly and the management rightly urges guests to be "vigilant". Yet all this creates a sense of serenity and peace that is so hard to define or artificially can. What sets the place apart is its whimsy, and small scale. There is BIG sky above - often blue - and low-rise intimacy below with just 50 corporate weekday guests perhaps from Scandinavian telecom firms, and weekend stargazing couples who delight in the nighttime candles and illuminations that bring the tableau to life. For 'Delhiwallahs', this is a cross between the India International Centre and the Lodhi Gardens. 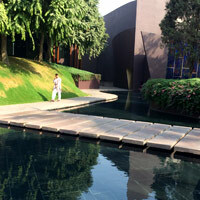 It is very much in tune with Delhi but is not your typical Delhi hotel. Access to the airport is another plus though it may be a stretch for some. Yet for small corporate meets, weddings, and special events, this is an intimate retreat with all day dining at Kiyan and authentic Chinese fare at Chi-ni. In-room expect a magnificent 60sq m of stretch space with white arches, echoing domes that amplify any cosy whispered sibilance, and cool marble underfoot (Roseate Rooms) or woody surrounds (Premier Rooms). In open plan garden rooms the bathing area is split left and right at the entrance with twin vanities sporting carved marble washbasins set against large well lit mirrors. The rainshower doubles as a steam room. An invitingly plump white bed faces a large flat-screen TV while a circular bathtub is set against the scenic window at the end of the room, disconcertingly far from the rest of the bathing area. So watch the drips. We did say 'resorty'. The entire place is run from an iPad that draws the blinds, dims the lights and orders from the menu. It also offers you a peep through the door camera to check on welcome - or unwelcome - callers. And WiFi is free. If all this is too space age, use the manual light switches or summon a round-the-clock "lifestyle manager" (they don't call them butlers here). For top-drawer stays, 11 pool view rooms provide an extra 40sq m of private pool deck area for lounging and walk-in water access. A signature Aheli Spa, mimicking the gardens of heaven, provides a regal Mughul setting with a filigreed and strikingly illuminated white diwan-i-khas - in the mould of palaces of yore. Step into Shah Jehan's world or fancy yourself in an Arabian Nights escape. Also sample a shimmering 102m temperature controlled outdoor pool. One of the prime features of this development is its attention to trees and the greening of the estate, a focus not lost on travellers in from the heat and dust. And for discerning or demanding travellers, there's the Club Prive. Mark this one down in your must-see diary. Also look for Roseate House New Delhi set in Aerocity right next to the airport in the new business development. Expect smart pale wood rooms with glass partition bathrooms, a spa, Club Prive, and boardrooms and function spaces for small corporate meetings or more. If it’s a 700m outdoor jogging track and tennis courts you are looking for then the 10-acre, 390-room The Grand New Delhi is for you. Located within walking distance of Delhi’s commercial hub in Vasant Kunj – which includes the luxury shopping Emporio Mall outlet - the standalone property, built from Dholpur stone, lies 15 minutes from the international airport. A cavernous beige and gold lobby is dominated by a domed interior covered in 22 carat gold leaf. Scattered faux palms inside compete with real trees outside. With its endless space it offers the largest Delhi hotel spa. Each massage room has its own separate shower. Unlike other luxury hotels the Grand lets outsiders use the gym for a daily charge. Premium rooms overlook nicely landscaped gardens. Broadband is available in rooms and must be paid for. WiFi is available at the lobby level at the same rate. The Grand has set up special "Single Lady" rooms for female travellers, and also boasts child friendly policies and disability services. 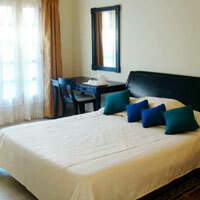 It also offers serviced apartments for long-stay guests. A huge draw, quite literally, is the Grand Ballroom, a 30,000sq ft event space that boasts its own separate entrance and parking space. An adjoining outdoor terrace offers a seating capacity of over 2,000. Located four kilometres from the airport smack against the elevated and busy Delhi-Gurgaon highway, the Radisson Blu Hotel Delhi (formerly the Radisson Hotel Delhi) is a red-brick affair that has played host to the Dalai Lama. Its large lobby houses an outlet from the Great Kabab factory chain, which has developed quite a cult following. The hotel has 256 rooms but the well-heeled business traveller will opt for one of the 41 Business Class rooms, which all overlook the gardens or pool. Guests can enjoy complimentary breakfasts, access to the Plaza Lounge, with its free happy hours and snacks, large personal safes, an in-room seating area and two hours in the meeting room for free. All rooms offer a few frills, including complimentary buffet breakfasts, free stays for kids under six, two-way airport transfers, free in-room WiFi and bottled mineral water, and daily newspapers. The Uppal’s Orchid Ecotel has been rebranded as the VITS Hotel Delhi. Catering to business travellers, it boasts 151 rooms, green space and exercise facilities. It doesn't come cheap though. Also near the airport, in a garden setting, is the more modestly priced (about US$170) 82-room Ashok Country Resort New Delhi, which also offers day rates for visitors in transit. Hotels in the central Connaught Place area cover all price ranges and are ideal to access restaurants, shops, and sightseeing. Located right in the hub of the action is The Connaught (previously the Hotel Connaught). Far from splashy, its cream-washed exterior makes it look like a large house rather than a hotel. Inside, find a slightly boring, small marble lobby, reception, and special facilities for the disabled. The hotel’s best rooms overlook Shivaji stadium where hockey matches are played at the crack of dawn in summer – to beat the heat. The more swank rooms are panelled in wood and can be a little overwhelming but are a favourite with foreign-domiciled returning Indians all year round. A computer room serves as a business centre, some basic conference facilities are available, and there is a small shop stocked with forgotten essentials. One of the best features of this hotel is its proximity to shops and restaurants in this lively neighbourhood. The ancient Nirula’s Hotel in Connaught Circus (also Rajiv Chowk) shut down a few years ago after losing its lease. Nirula’s has two other hotels in Noida and Panipat. The more recent The Q Bed & Breakfast by QBA, at Malcha Marg Market near the city centre boasts sleek modern rooms with WiFi. This tiny hotel serves up a handful of smart rooms with LCD televisions. It is well located for a dash to the airport or Gurgaon but close enough to downtown and the market offers an array of food from Chinese and Japanese to Indian Mughlai. This is a nice upscale residential area with plenty of green. Downstairs, find the popular QBA, a hopping night spot with live music and a chic all-black bar. In Old Delhi's Chandni Chowk area tucked away in a nondescript alley is the very basic, small and friendly 33-room Hotel Tara Palace. Expect aircon, ceiling fans, colour TV, telephone, Internet access, en suite baths, 24-hour restaurant and value rates that won't bust the bank. All bookings also include free breakfast and airport pick-up. 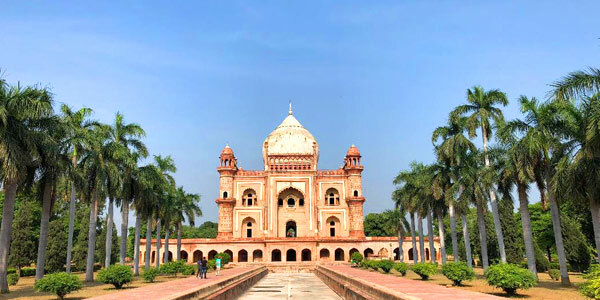 This is Delhi's historic quarter with Mughal era architecture littered about from the magnificent red sandstone Red Fort to the minarets and grand dome of the Jama Masjid mosque, which can be enjoyed from the hotel’s roof. South Delhi is teeming with guesthouses. They may not be plush but they are certainly more cost effective than five-star hotels and offer a personalised touch in a Delhi home. In Sundar Nagar is the smart and cheerful Jukaso Inn that has also opened a hotel in Gurgaon. With a terrace garden, the 33-room guesthouse is favoured by academics and Western visitors. WiFi is available on the premises. Club Executive rooms are compact but have smart, modern amenities, and the suites are nicely decorated – no longer their former dusty incarnation. Just be careful when booking not to get confused with the hotel’s other property in Delhi – Jukaso Inn Down Town, located in Connaught Place, a slightly older and mustier incarnation. Boutique La Sagrita tourist home, also in Sundar Nagar, has smaller rooms but is fortunate enough to be overlooking a pleasant park. All rooms are en suite, and include a private terrace and in-room kitchenette. Located in splendid seclusion in a spiffy New Delhi suburb, walking distance from the beautiful Lodhi Gardens, is the 11-room Ahuja Residency, a Golf Links guesthouse that has been in operation for almost 30 years. It faces one of the suburb’s many parks and caters mostly to diplomats and UN officials. Internet is available in the rooms and an in-house computer is located in the lobby. This fast growing chain has also opened similar guesthouses in Defence Colony and more recently in Sunder Nagar, as well as serviced apartments for long stay guests. Also in South Delhi's suburban Defence Colony, well located for most city sights and business, is the whimsically named Colonel's Retreat, a boutique bed and breakfast that continues to win guest accolades for its "clean, good-sized rooms and friendly service". Singles can stay at a very reasonable Rs5,100(with breakfast, water, tea and coffee) or around US$93. Extra beds can be had for just Rs500. All rooms are doubles, and you can expect decent bathrooms, flat-screen TVs, a fridge, electronic safe, work desk and, best of all, complimentary WiFi. Meals are available round the clock and laundry is a snip. Within the same residential enclave, you will find Casa Delhi, run by Casa Boutiques hotel chain, which also operates sister Casa Friends in New Friends Colony. The two suites and five rooms all featuring works of art by contemporary Indian artists, and the Mediterranean-themed villa’s ground floor includes a communal lounge, dining area, an outdoor garden with barbeque and bar. Useful if you want to retreat from the hustle and bustle of the city. A young 2013 addition to the Delhi mod hotel scene is the bright and cheery bloomrooms hotel opposite the Jangpura Metro Station (and across the road from from Defence Colony). 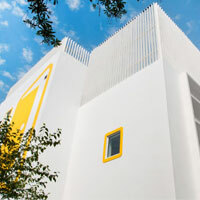 Kitted out in eye-catching yellow daubed across starched white, the hotel is hard to miss. It is simple, neat, surprisingly clean (with not many windows) and stands almost like a bright refrigerator at 7 Link Road, Jangpura Extension. Rooms are compact but intelligently designed and kitted out with useful essentials like electric sockets (three-pin multi-plug) and reading lamps. Everywhere you'll spot the signature bright yellow trim. The doors are yellow too. WiFi is free and a couple of 24-inch iMac stations are on hand for a quick Internet surf if you forgot your laptop en route. Expect a small lounge and a pint-sized Amici cafe that churns out a variety of nibbles. 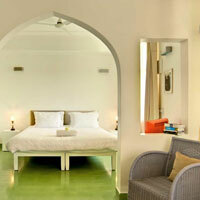 Squeeze into a Compact Room for the best discounts running between Rs1,500 and Rs2,000). There is a sister property near New Delhi Railway Station too. In Greater Kailash, the Madhuban Inn, managed by Peppermint, is one of the city’s older guest houses and located conveniently opposite a bank. Used by short-stay business travellers and wedding parties, good long-stay rates are also available here. Recently refurbished, the hotel offers free WiFi, complimentary newspapers, mineral water and 24-hour in-room dining. In the smart Hauz Khas residential enclave is the Amarya Haveli, which boasts six en suite rooms, each named after a major city in India. Each room is individually colour-themed and has complimentary Wi-Fi, 24-hour room service and even spa offerings and massage on request. This converted residence in a quiet upscale neighbourhood offers a homey feel with boutique flourishes evident in the bright splashes of colour on the walls and through elaborate use of bright-hued cushions. A gravelled patio on the ground floor serves as a reading or breakfast area while a rooftop terrace - also with gravel underfoot - offers a sunny winter retreat for a sit-down with a good book. In the pink room, find a pink door, a small LCD TV, a glass cubicle with rain shower, and of course the wonderfully free WiFi. Alex Lieury, the French owner was formerly in the fashion business and later decided to create the haveli to show friends what "life in India" could be like. His take on India includes curios, old furniture and coffee table books. The pace is slow and unhurried - just as at home. 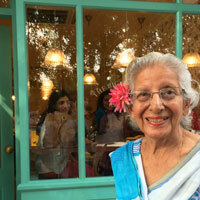 Alex also runs the Amarya Villa in Safdarjung Enclave, and a chic beachside hideaway in Goa. In bustling Hauz Khas Village, you'll find The Rose - an 11-room hippy hangout that should be on any New Delhi boutique hotels list. It is set in an old-style village home with the beautiful Mughal ruins as a backdrop and offers light and airy rooms for everyone from the budget traveller to the slightly more well-heeled wanderer. Room rates vary between Rs3,000 and Rs8,000, for a night. All rooms include WiFi and breakfast - and we recommend spending some time relaxing at the in-house Rose Cafe, which has also become a popular local Sunday brunch spot. 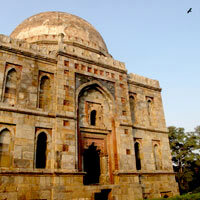 Hauz Khas Village is negotiated on foot and cars park just outside the village perimeter. If you want a cosy home-style experience, sample Scarlette (formerly Colaba House), home to French expat Pio Coffrant, who also runs The Rose hotel. Parked along tree-lined Safdarjung Enclave, this boutique lodging offers rooms that are bright and airy with modern Indian touches. All rooms are air-conditioned and come with a flat-screen wall-mounted TV. The entire house is WiFi enabled. The room Sofong comes with a private terrace and a sitting area for a not-too-pinching Rs6,500 a night for a single with breakfast. But perhaps the best part of this retreat is the "Greenhouse" where you can curl up with a book, or follow management's advice and invite a few friends over - just as you would at home. If you're in town for a longer stay, take up one of the two immaculately furnished serviced apartments which are located just across the street. 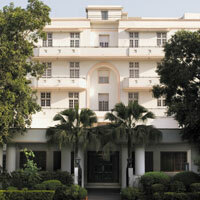 More stylish, and on same road as Taj Palace and the Maurya in the Diplomatic Enclave, is Hotel Diplomat. With 25 rooms, it is a clean, smart hotel sometimes accommodating an overflow from its more upmarket competition up the road. It’s also home to the stylish Mediterranean restaurant and bar, Olive Beach, popular with the local diplomatic community. The chic b nineteen hotel in Nizamuddin East (the quieter and leafier side of this neighbourhood) is a mod escape in a laundered white cubist confection with bright splashes of ochre, lime green and blue. It's perfect for those yearning for the comforts of home. Each of the six suites has a living area, en suite bathrooms, private terraces or balcony and Wi-Fi (free for long-term guests, or Rs200 a day). Try to bag the penthouse suite, as this offers unobstructed views of the spectacular Humayun’s Tomb (the forerunner of the Taj Mahal in Agra). This intimate New Delhi boutique hotel also offers a library and rooftop terrace. Guests have kitchen access, so you can cook your own meals if the strong local flavours are getting the tummy rumbling. Each room has a differing design, the handiwork of architect owner Rajive Chaudhry, whose passion for organising space is evident throughout. Rajive returned from the USA to set up a genuine home for travellers and picked this secluded corner of Nizamuddin a short drive from the heart of town. In-room expect orange walls, grey-stone floors, brightly patterned Indian fabrics, small LCD screens, and a mosquito net hanging above the bed. Bathrooms are reasonably generous. The Penthouse has less bathing space but serves up a steam room. Can't complain. A bit farther out of town in the Vasant Kunj area near Mata Chowk is another New Delhi budget hotel choice, the Hotel Metro Tower. The facilities are simple and unassuming, and very convenient to get to with the complimentary airport transfer. Expect brightly painted air-conditioned rooms with satellite TV and mini-bar, 24-hour room service, attached bathrooms, laundry services, and even a small roof garden. Rates here will set you back just between Rs1,800 double occupancy to Rs3,000 (for a double bed family room). Sister Hotel City Centre in Connaught Place has similar offerings in a more central location. As the hub of Delhi’s burgeoning information technology business, Gurgaon is seeing the launch of many new hotels. The modern curving glass facade of a Starwood property, the Westin Gurgaon, located just fifteen minutes from the Indira Gandhi Airport, looms above IFFCO Chowk, a particularly busy intersection. To get around this traffic snarl the hotel access is via a side road off the highway with lots of beckoning greenery. The hotel boasts 313 modern rooms replete with views of Millennium City and a high-ceiling lobby in corporate pastels and earth tones. Expect Internet, an iHome dock, flat-screen TV, DVD player and rain forest showers. 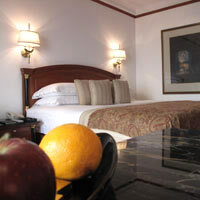 A stay on the Executive Floors offers frills like access to the Club Lounge, early check-in, late check-out and more. An Executive Suite offers cool marble floors with carpets and pale pinewood walls, a large living space, a spacious light-filled bedroom and a roomy bathroom with bathtub. A sliding smoked glass door leads to the bathing area and its twin vanities. In-room find an iron and ironing board, a flat laptop-size safe, weighing scales, iHome dock, and several three-pin multi-plug sockets. Floor to ceiling windows are welcoming of light and dramatic peak-hour traffic views that will drive home the value of being parked in an oasis like the Westin. There are smoking floors as well as rooms for women travellers with extra amenities and dollops of pink. Parents can drop off their kids at the Kids Club for fun stuff like board games, Xbox or old-fashioned books (remember them? ), while they enjoy the Heavenly Spa or relax by the outdoor pool. There is a WestinWORKOUT area but no WestinWORKOUT rooms. An older and stately choice from the Oberoi group is the Trident Gurgaon, 10 minutes from the airport and 35 minutes from India Gate. With its domes and stone trellises, the exterior of this minimalist property offers a fusion of Middle Eastern, Mughal and contemporary. The low-rise hotel blends into the landscape. A central reflective pool lined with Italian tiles absorbs the traffic sounds from National Highway 8. To play down human activity the hotel has no obvious driveway. Guests walk to the lobby and its gold-leaf domed ceiling while the luggage gets whisked away to your room from the main entry point. The serenity, space and seclusion is apparent in the 136 rooms as well. Most are located on the ground floor. Superior and premium rooms are available with pool or garden views. Executive suites overlook a water feature adorned with fragrant frangipani trees, along with a living room, powder room and a walk-in closet. Butler service is available for all guests and if requested female butlers can cater to women travellers. Other amenities include WiFi, satellite TV, tea and coffee facilities, safe, hairdryer and personal bar. For all its apparent quietude, the Trident is very, very corporate, a fact reflected in the conference rooms, which have facilities like drop-down projectors and video conferencing. Business travellers will enjoy its Business Travel Plus program, which offers complimentary breakfast, free WiFi, 9am check-ins and one way airport transfers. Check out the swimming pool, spa and fitness centre for some relaxation as well. Premium rooms offer ergonomic chairs. The hotel also downloads and prints newspapers for guests from their home country. 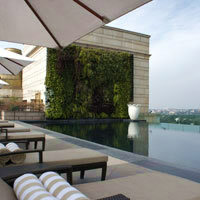 Far larger, and set up as a prime address for New Delhi conference hotels, is the The Leela Gurgaon, Delhi (NCR). It is joined at the hip to The Leela Residences Gurgaon. Together they offer 322 spacious rooms and 90 serviced apartments for long stay visitors in need to extensive business facilities. The Leela is a modern reflective glass structure that links with the kilometre-long Ambience Mall Gurgaon (locally referred to as Ambi Mall). As a meetings hotel, expect over 2,000sq m of convention and conference space. In-room there's WiFi and wired Broadband plus the usual modcons with a 40-inch flat screen TV. 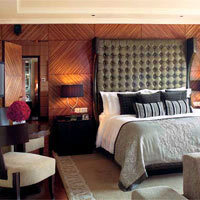 Two premium luxury Royal Club floors are also on offer, with benefits similar to sister Leela Palace New Delhi. The dramatic glass and steel structure of the Oberoi Gurgaon (opened early 2011), set amid nine acres of lush gardens and water features, might stir the pot with its super-luxury 202 rooms and suites, all of which offer views of gardens or the pool. Each room also includes personal butler service, 45-inch TV, DVD player, iPod dock, WiFi, a separate seating area and artwork by young and upcoming Indian artists. Some Premier Suites offer personal heated pools, an open deck, two bedrooms and a whole host of other benefits. You may need to sell the kids though. Also expect an Olympic-size pool and a 24-hour spa to sooth even the most jetlagged of guests any time of night. Also open round the clock is the gym, which offers complimentary yoga classes every morning. Corporate events can also be arranged here in any one of the two Grand Ballrooms, ten meeting rooms and even outdoors in the gardens. There’s also all-day dining restaurant Threesixtyone, with its five kitchens serving up Japanese, Chinese, Italian, and Indian cuisines. Located in Sushant Lok the 45-room Park Plaza could almost be a boutique hotel. It’s small enough, standing on just half an acre, but perhaps its style is not classy enough. It looks like a clean European hotel catering for IT executives. Standard rooms overlook a busy highway. Rooms are spacious but a little soulless and come with all the routine accoutrements – safe, coffee and tea-making facilities, WiFi, hair dryer and mini bar. A wellness centre is available as is a rooftop pool. Rates, especially corporate ones, are extremely negotiable. Similar sounding but closer to the airport is Hotel City Park, Airport, in Kapashera, Gurgaon, just off the toll road, with unfussy rooms, Japanese cuisine, and small conference space. This is a trusty Delhi Airport budget hotel choice, far better than the depressing row of small ramshackle 'inns' masquerading as hotels along the airport expressway. The group has other budget hotels in Delhi locations like Pitampura and Mundka. The Fortune Select Global Gurgaon looks a little tense – squeezed in between two hyperactive shopping malls. That minor blemish aside, this is a smart looking modern business hotel. It is part of the ITC chain’s Fortune Hotels selection. It has a fast turnover and caters to middle-rung business travellers looking for good rates and efficient service. It boasts nine suites, 60 standard rooms, 20 Fortune Club rooms and 18 Fortune Club Superior rooms. Club rooms are adequately sized, though some bathrooms come without a bath tub. Enjoy WiFi connectivity, TV, work desk, minibar, safe and Club Lounge access with any purchase. Also in Gurgaon is sister Fortune Select Excalibur, which also caters to business travellers and is slightly cheaper. Cinderblock IBIS Hotel Gurgaon is un-noteworthy from the outside but a pleasant surprise inside. Rooms are compact, clean and smart, with up-to-date décor in each of the 217 functional rooms, with flatscreen TV and free Internet. 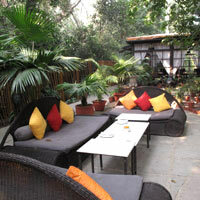 The small Lemon Tree Hotel, CityCenter, is a bright, friendly and unfussy option in Gurgaon. You’ll find 45 rooms with WiFi, cable flat screen TV and, usefully, for that end of day unwind, an orthopaedic mattress and blackout curtains. There is a business centre, fitness centre and meeting facilities for 30-70 people. It also offers a special room for physically challenged guests. Similar facilities are available at sibling hotel Lemon Tree Hotel, Udyog Vihar, another good value Gurgaon hotel contender. The 285-room Hotel Pullman Gurgaon Central Park (opened late 2011) is a good spot for health fanatics with an outdoor pool, 18-hole golf course, bowling, tennis, basketball, snooker and even an athletics stadium. It is close to the Delhi border (coming from Mehrauli) and offers quick access into the heart of Gurgaon bypassing congested crossroads. 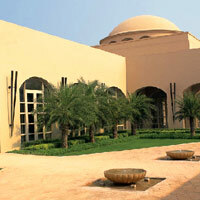 A short way out on the Sohna Road is the small and neat brickwork Westin Sohna Gurgaon Resort & Spa. 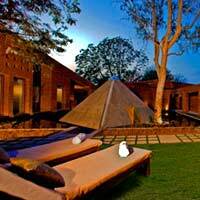 The hotel is set in manicured lawns with uplit trees and water features. It caters for leisure traffic and doubles comfortably as a small meetings hotel for Delhi corporates and more. Expect two pools, a spa, and the usual WestinWORKOUT and plunge-in beds. Shopping in Delhi ranges from utterly extravagant – where Indian haute couture costs upwards of Rs200,000 (about US$3,700) – to mid-priced malls and inexpensive roadside bargain shopping on Janpath where everything from t-shirts, Tibetan jewellery, fake antiques, and Rajasthani mirror-work fabric, dresses, and cushion covers are on display. A lakh is a unit of 100,000 and this is a term you’ll frequently encounter in India if on business or doing anything dealing in large sums. Each residential area hosts a local market with provision stores. But the larger ones like South Extension, Greater Kailash, Defence Colony, and Khan Market also contain a vast array of curio, antique, art, clothing, book, flower, handicraft, and electronic shops. There’s also the up-and-coming Meher Chand Market near Lodhi Road, which boasts some excellent coffee options, Indian clothing, bedding and curio shopping for adults and kids alike. Publisher Roli Books runs CMYK, a well-stocked bookshop here, great for coffee table discoveries. Most areas have different closing days (often Sunday or Monday), so check before going. If your New Delhi shopping brief includes classy, upmarket Indian designer brands and fashion, head to Santushti Shopping Complex in Chanakyapuri, near the Ashoka hotel, home to a clutch of leading boutiques and designer outlets. If you tire of shopping, Basil and Thyme (lunchtime only) is located in same complex and known for its high quality desserts. The entire complex is closed on Sundays and public holidays. DLF Emporio and less expensive sisters DLF Promenade and Ambience Mall in Vasant Kunj offer stylish western shopping. DLF Promenade has several good eateries, including Smokehouse Deli, Keya Bar and even South African import, Nandos. It also boasts its own private open air theatre for some relaxation after shopping. Walk across to Ambience Mall for a bite at Kylin Premier, a nice rooftop restaurant, or check out a movie and relax in a La-Z-Boy at PVR’s Director’s Cut cinema. N Block Market in Greater Kailash II offers a slightly more organized feel with boutiques, shoes, crystal-ware, and so forth. Don’t forget to pop by Cafe Diva for some Continental food, Sidewok for a taste of Asian, or the rebranded S Bar. When planning your day, keep in mind that both are some of the busiest markets in Delhi and prone to heavy traffic congestion. Technophiles should try Nehru Place. Check out their website (www.npithub.com) for quotations and services beforehand to avoid wandering around aimlessly. Another option is Palika Bazaar in Connaught Place, which boasts a huge array of gadgets, among other things. It was revamped to reduce overcrowding and make a decent stab at a more organised shopping experience. Still, it may be overwhelming for some. Make sure what you buy isn’t fake. Many "authorised" shops are not what they appear. Again, bargain bargain bargain or end up with that infamous "foreigner" price. Delhi and Gurgaon shopping malls have mushroomed. 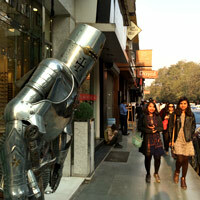 There are several prominent South Delhi malls but avid shopaholics should head to the Saket District for a real treat. The Metropolitan Mall, Courtyard, and South Court are some you will find here. But the star attraction is definitely the sprawling six-acre behemoth Select Citywalk. With over 1.3 million square feet of space, it boasts three separate zones and 125 shops where international mega brands like Zara, Esprit and FCUK rub elbows with more traditional fare usually found in the likes of Dilli Haat. 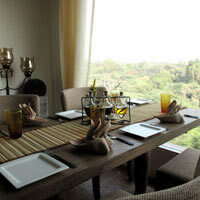 It also offers multiple dining options for all budgets and a cinema multiplex. Relax after breaking the bank in the luxurious 100,000sq ft outdoor plaza, with amphitheatre, mood lighting and water fountains. Other South Delhi malls include Ansal Plaza and Shopper’s Stop in Andrew’s Ganj and Westside in Lajpat Nagar. Not enough? Pop on over to Gurgaon, to the Ambience Mall, which caters more to a younger crowd (mainly teen fashion), and has a play area for kids to romp about in while parents try to squeeze in some retail therapy. By far the largest mall in India, this behemoth has 1.8 million square feet of space including a cinema multiplex, bowling alley, ice skating rink, golfing area, and a theme park for the little ones to go wild in. No time to waste? No problem. Visit their website (www.ambiencemalls.com), pick your spots and view floor layouts for your plan of attack for this mammoth one-kilometre long shopping mall. Other choices in the area include Sahara and Lifestyle malls. Quality is assured and most outlets will exchange items within a short timeframe if they have not been used. For Indian handicrafts, traditional items, and quality textiles, opt for the Cottage Emporium on Janpath, next to The Imperial. A government-run enterprise, prices here are fixed and haggling is not the norm. Similar to this are the various State Emporiums selling regional specialties along the Rajiv Gandhi Handicrafts Emporium strip on Baba Kharak Singh Marg off Connaught Place. Dilli Haat (open all week), is a fun open-air market in South Delhi, whose vendors change frequently, and usually come from various states around India. It offers a serendipitous experience where you can bargain your head off. There’s a respectable selection of Indian ware and prices are much lower compared to the Cottage. It’s not just for shopaholics though – foodies will enjoy the varied Indian cuisines hawked from fixed food stalls. Try Navdanya’s organic fare, and wash it down with a cup of traditional ”Kuladh” chai (served in a clay cup) from the Rajasthani tea-vendor. For a taste of shopping in a fully functioning Indian village, head to Shahpur Jat or Hauz Khas Village, where the narrow by-lanes are filled with life – and maybe a cow or two – amid some of the city’s trendiest boutiques and Indian clothing outlets. In Hauz Khas Village in South Delhi you’ll find Ogaan (H-2 Hauz Khas Village, tel: 2696-7595), for Indian and Western styles. There’s also the Parisian-chic Lola’s World Boutique (Shop 1, Hauz Khas Village, tel: 6451-4201), filled with beautifully crafted clothes, accessories, and home goods aimed at both children and adults. Trawling for Indian designer brands, women will certainly enjoy the funky boutiques and bohemian atmosphere of Hauz Khas Village set amidst old stone ruins. Explore art, movie posters, jewellery, fun accessories, dresses, silver, and gifts made from recycled materials including elephant poo. That's right. Check out Green the Gap at 24/3 Hauz Khas Village for a slice of elephant dung action and recycled truck tyres and soya milk cartons re-emerging as smart wallets and purses. Chandni Chowk in Old Delhi is known for its jewellery shops and silverware and Lajpat Nagar Market and Shankar Market are recommended for their inexpensive textiles and fast tailors. Janpath is still the go-to favourite for souvenirs and juttis – Indian leather shoes – to take home for yourself and everyone else on your shopping list. A favourite Delhi shopping stop for visitors is Fabindia (Greater Kailash N Block Market, Khan Market, and pretty much anywhere in Delhi these days) where a huge array of clothes and furnishings is available. 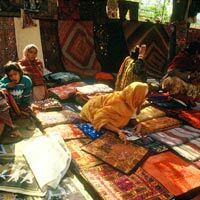 Also popular are Anokhi (Khan Market) and Soma (Meher Chand Market) which focus on Rajasthani prints and fine cottons. Bargain hunters willing to get elbow-deep in pedestrian traffic should head to Sarojini Nagar Market or Central Market in Lajpat Nagar for cheap clothes and shoes. Be ready to haggle. Top quality leather products can be had at a price at Nappa Dori (Shop 4, Inner Lane, Hauz Khas Village), or at one of Da Milano’s several locations across the city (Citywalk, Connaught Place, M Block Market). A slightly cheaper alternative is Hidesign (Citywalk, Connaught Place, N Block), which offers a wide selection with better value. If you want a great quality pair of shoes – made to order or right off the rack – check out K S Lee (30-B Khan Market, tel: 2463-2657), run by two brothers who know their leather goods by heart. For a quiet hang-out, with coffee shops, bookstores, and flavourful Indian Chinese restaurants, close to the Lodhi Gardens, try Khan Market. This is a popular and busy low-rise development that attracts local residents and plenty of foreigners for its array of boutique clothing, casual fashions, trinkets, home products, book shops and small speciality stores. Pick up a silk saree for around Rs1,500 to Rs3,500 or a richly-worked kanjeevaram for Rs6,500. Pop into The Neemrana Shop (23-B Khan Market, tel: 4358-7183), Good Earth (9 Khan Market, tel: 2464-7175) for brilliantly-hued silk cushion covers, bed runners, table cloths and other fabrics for the home, and Jai Raj Arts (25-B Khan Market) for your trinket haul of bracelets, bangles and necklaces. Along the Khan Market alleys are newspaper vendors, and Kashmiri shawl merchants peddling intricate jamewars for Rs1,500 and up. Don’t forget the popular Jaipur jewellery items at Amrapali (39 Khan Market, tel: 4175-2024), with silver pieces on the ground floor and expensive gems upstairs. Also find excellent silver bangles and other buys at P Mehra Jewellers (79-A Khan Market, tel:2469-0604), an informal hole-in-the-wall stall tucked into the corner along the outside stretch of the market next to Big Chill cafe. Finely carved silver bangles from Rs600 up based on weight. For a classy personal shopping concierge experience that eliminates the heat and dust and cows, get in touch with the charming and very in-the-know Binita Rawlley (www.binitarawlley.com) who will whisk you off on personalised itineraries. Dining in Delhi ranges from streetside food (a challenge to any Western constitution, inducing what is fondly termed Delhi belly) to signature high end restaurants such as The Imperial’s Silk Route and Maurya’s Bukhara (known for its North West Frontier cuisine). A meal for two in these restaurants, without drinks, will likely cost Rs3,500 to Rs4,000 and buffets run at Rs2,500 per person. Tru the expanded Sunday brunch buffets. Another top pick is Indian Accent at the Manor in Friends Colony West, where Chef Manish Mehrotra is acclaimed for his tastefully offbeat pairings, such as his foie gras stuffed galawat and mini blue cheese naans. Delhi loves food, and you’ll find some interesting and tasty combinations at elegant but easy-on-the-wallet Tres (Lodhi Colony Market), where Continental cuisine comes in the form of fresh, seasonal produce, meats and seafood, as well as an excellent array of desserts. Or head to the beautifully decorated Chez Nini (Meher Chand Market), for a taste of French-Canadian and red velvet cupcakes in Delhi. More economical but less splashy are Ploof (Lodhi Colony Market), famous for its selection of fish from all corners of India. Take a seat on the freshly renovated roof-terrace for great vibes and views. Lunch at Smokehouse BBQ atop the aptly named Crescent Mall in Lado Sarai is also worth a try. The beautiful Olive Bar and Kitchen in One Style Mile in Mehrauli offers the opportunity to sit under the stars in a former Mughal mansion, and taste fresh brick-oven pizza, while Japanese eatery Tamura in Green Park remains a favourite among expatriates and even Buddhist monks. Cost for two without drinks at these eateries is about Rs2,000. Dilli Haat also boasts a nice outdoor seating area offering food stalls from various states. Or walk into Lodhi Gardens from Lodhi Road and enjoy fashionably alfresco or air-conditioned dining, looking onto splendid greenery and old Sultanate tombs at Lodi - The Garden Restaurant (tel: 1874-3232). Winter is the best time for this spot. Friendly but slow service will give you ample time to get acquainted with your guests. Food isn’t particularly top notch, but it’s worth a visit just for the atmosphere. Later stroll through the gardens and marvel at ancient mausoleums. Not far from here, the Big Chill Café in Khan Market offers a wide array of beverages and vegetarian and non-veg Italian options. Peruse the collection of old movie posters that dominate the walls from floor-to-ceiling and dig in while Cary Grant and Audrey Hepburn look on. An alternative is Mamagoto, also in Khan Market, serving Oriental cuisine. Don’t forget to try the rock shrimp tempura, and be sure to read the instructions for how to wield a set of chopsticks. For something very Bohemian, and constantly changing, try Hauz Khas Village that is turning trendier by the minute. It is still rustic, but romantic, despite the dust and carts and cows. At the end of the road is the atmospheric Hauz Khas monument and "tank" or lake while on either side of the narrow lane are low-rise shop houses displaying artsy fashion, books, and more. It is here you'll find Amour (tel: 9711-877-134) up on the fourth floor accessible by an impossibly small lift. Enter to find a vaulted ceiling with chandeliers, grand views of the deer park through large glass windows on one side and an open-air patio on the other with views of the lake. The decor is attractive and the outdoor area is a huge draw in winter. But go just for the drinks and the ambience. This is romance as you've never known it in India. For good South Indian food in Delhi – dosas, idlis, vadas – you’ll get value for money at the Sagar chain (Defence Colony and Mallika Nagar markets). Sagar also runs an outlet at the Ashoka Hotel. The restaurant is purely vegetarian and does not serve alcoholic drinks. A meal for two is around Rs300. Its non-vegetarian sister chain, Swagat (Defence Colony Market) serves excellent crabs and a meal for two kicks in at Rs800. More grungy, hugely aromatic, and strongly recommended for all intrepid travellers is the ever-popular Karim’s – the original sits in a side street close to the Jama Masjid in crowded Old Delhi. It serves a vast selection of Muslim meat dishes and now has several branches across the city – the best of which can be found in the alleys around the Nizamuddin Dargah, in South Delhi. For fast and cheap food, try Haldiram’s, easily spotted throughout the city, with a wide array of Indian snacks and sweets. Most restaurants stop taking orders by 11pm. Coffee purists can look out for the best coffee at the independent stores across the city, such as at The Mad Teapot at the Wishing Chair in Shahpur Jat (86-A Shahpur Jat, tel: 4657-2121)– which sells home goods and creations – inspired by the Enid Blyton book series. Another fun outlet is Flipside Café in Hauz Khas Village (Shop 7, 1/F, Inner Lane, Hauz Khas Village), where coffee is served up along with superb crepes and waffles that won’t break the bank. For must-try South Indian Coffee, head to Coffee Home, a slightly dive-ish looking establishment on Baba Kharak Singh Marg. Then there are the chains – Costa Coffee, Barista Lavazza (commonly known as Barista), Café Coffee Day, Dunkin Donuts and Mocha. Besides serving beverages, mostly coffee, they offer light snacks for those on the go. Art lovers might try out Mocha Arthouse in the DLF Promenade Mall, which brings together funky art pieces and freshly brewed coffee, sprinkled with some light snacks and electronic music. Starbucks has arrived in Mumbai, and will likely make its way up to Delhi in the near future. Delhi nightlife is almost an oxymoron in a city where entertaining is largely done at home or at one of the many elite private members clubs (Gymkhana, Delhi Golf Club), in civilised surrounds, with The Eagles or Ravi Shankar playing. But an emerging generation of intrepid party-loving Delhi-ites with money to burn means there is a rapidly expanding bar scene. Top Delhi bars are usually located in luxury hotels, such as Blue Bar in the Taj Palace Hotel, Fbar at the Ashoka, and Ricks Bar at The Taj Mahal. Others include long-standing tourist hotspot Urban Pind (N Block Market, Greater Kailash-I), QBA in Connaught Place’s Inner Circle and Malcha Marg, and The Imperial’s 1911 Bar, with its staggering 500 drinks. A hop, skip and a jump away, Ivy in New Friends Colony boasts the longest bar in Delhi at 42 feet. For something less upmarket, check out the Living Room (or TLR, as it is also known) in the smart rural-chic enclave of Haus Khas Village, which offers informal music events and drinks at reasonable prices. Many of these close early, around 1am, due to a government curfew on noise in residential areas. Creatures of the night, have no fear. The nightclub scene is ever-changing. The city’s rich and beautiful can be fickle about where to groove through the night, but hot spots include Anidra, Kitty Su at the Lalit, Hotel Samrat’s exclusive club Lap, and Shiro. Alternatively, head over to Quantum The Leap at the Centre Stage Mall in Noida, which has replaced former exclusive local club, Elevate. Clubs in Delhi have a frightening turnover rate, so check that your spot is still open before you head out. A side note: Delhi has government imposed "dry" days throughout the year where alcohol cannot be sold at all (check up this year's dates on the government website, www.excise.delhigovt.nic.in). Cultural activities tend to peak during winter though cultural hubs like the India Habitat Centre, India Islamic Culture Centre or the India International Centre, all near Lodi Road, do offer regular dance recitals, films and lectures. Hotspot Dances of India close to Connaught Place offers live ethnic dance performances from all over India every evening at 7pm. Theatres near Connaught Place like Kamani Auditorium, the National School of Drama, and Sri Ram Centre, regularly run plays. If all this fails to interest, check out the National Rail Museum (off Shanti Path, Diplomatic Enclave) for some ripe old chuggers and ancient cabooses. It's a great spot for the family and kids and there's a steam engine ride too. At the other end of the city on the National Highway (NH24) towards Noida is the the giant, hand-carved Akshardham Temple built in a classic style without structural steel framework. The stone edifice was built by 11,000 artisans and opened in 2005. That’s the A to Z of New Delhi business hotels with a fun guide tossed in. Well, as I said, throw away that watch and head into Indian Standard Time. The exchange rate is roughly US$1=Rs70. Any best available internet rates listed here are for comparison purposes only. Daily rates will fluctuate considerably especially during the low season. A 12.5 percent luxury tax will apply in Delhi. Gurgaon has a luxury tax of 10 percent. 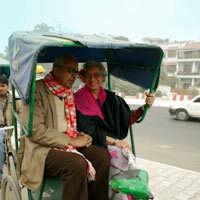 A useful link to city happenings and fun trivia is Little Black Book Delhi (littleblackbookdelhi.com). Cox and Kings. Address: Indra Palace, H-Block, Connaught Circus, New Delhi-110001. Tel: [91-11] 4129-7900/ 2373-8811, fax: [91-11] 2331-7373, (www.coxandkings.com or www.bharatdekho.com). GoDelhi. C-21/A, 2/F, Supermart Commercial Complex I, DLF-IV, Gurgaon 122016, Haryana. Registered office: Block 18, Flat 604, Heritage City, Gurgaon, Haryana. Mob:  9899-888-207 (10am-8pm), (e-mail: poonam@godelhi.net or info@godelhi.net or www.godelhi.net). Ibex Expeditions. 30 Community Centre, East of Kailash, New Delhi-110065, Tel: [91-11] 2646-0244/6, Fax: [91-11] 2646-0245, (e-mail: ibex@ibexexpeditions.com or www.ibexexpeditions.com). Sita, Tower B, Delta Square, M.G. Road, Sector 25, Gurgaon-122001, Haryana. Tel: [91-124] 470-3400, fax: [91-124] 470-3100, (e-mail: info@sita.in orwww.sita.in). Travel Corporation of India (TCI). 520 Udyog Vihar Phase III, Gurgaon 1220016. Tel: [91-124] 612-0100, (e-mail: inbounddel@tci.co.in or tcindia.com). Clarion Collection by Choice Hotels. Tel: [91-11] 4120-0000, fax: 2696-8287, (e-mail: info@clarionnewdelhi.com or reservation@clarionnewdelhi.com or www.clarionnewdelhi.com). Eros Hotel Nehru Place (formerly InterContinental). Tel: [91-11] 4122-3344, fax: 2622-4288. Hyatt Regency. Tel: [91-11] 2679-1234, fax: 2679-1122, (e-mail: delhi.regency@hyatt.com or delhi.regency.hyatt.com). Hilton New Delhi/Janakpuri. Tel: [91-11] 4123-4123, fax: 4123-4124, (www.hilton.com). ITC Maurya, New Delhi. Tel: [91-11] 2611-2233, fax: 2611-3333, (e-mail: reservations.itcmaurya@itcwelcomgroup.in or reservations.maurya@itcwelcomgroup.in or itchotels.in). Le Meridien New Delhi. Tel: [91-11] 2371-0101, fax: 2371-6996, (e-mail: info@lemeridien-newdelhi.com or www.lemeridien-newdelhi.com). The Leela Palace New Delhi. Tel: [91-11] 3933-1234, fax: 3933-1235, (e-mail: reservations.newdelhi@theleela.com or www.theleela.com). Metropolitan Hotel New Delhi. Tel: [91-11] 4250-0200, fax: 4250-0300, (e-mail: info@hotelmetdelhi.com or www.hotelmetdelhi.com). Radisson Blu Marina Hotel Connaught Place. Tel: [91-11] 4690-9090, fax: 4690-9091, (e-mail: reservations@rdmardel.com or www.radisson.com). Shangri-La's – Eros Hotel, New Delhi. Tel: [91-11] 4119-1919, fax: 4119-1988, (e-mail: slnd@shangri-la.com or www.shangri-la.com/newdelhi). Shervani New Delhi. Tel: [91-11] 4250-1000, fax: 4150-7405, (e-mail: delhi@shervanihotels.com or shervanihotels.com). Taj Mahal Hotel New Delhi. Tel: [91-11] 2302-6162, fax: 2302-6070, (e-mail: mahal.delhi@tajhotels.com or www.tajhotels.com). Taj Palace Hotel New Delhi. Tel: [91-11] 2611-0202, fax: 2611-0808, 2688-4848, (e-mail: palace.delhi@tajhotels.com or www.tajhotels.com). The Ashok. Tel: [91-11] 2611-0101, 2611-6161, fax: 2687-6060, 2687-3216, 2687-6378, (e-mail: ashoknd@ndb.vsnl.net.in or ashokhotel@vsnl.com or www.theashok.com). The Grand. Tel: [91-11] 2677-1234, fax: 2670-5891, (e-mail: reservations@thegrandnewdelhi.com or www.thegrandnewdelhi.com). The Lalit New Delhi. Tel: [91-11] 4444-7777, fax: 4444-1234, (e-mail: newdelhi@thelalit.com or www.thelalit.com). The Lodhi. Tel: [91-11] 4363-3333, fax: 4363-3335. (e-mail: reservations@thelodhi.com or www.thelodhi.com). The Manor. Mobile:  98711-17968, tel. [91-11] 2692-5151, 2692-7510, fax: 2692-2299, (e-mail: manor@oldworldhospitality.com or info@themannordelhi.com or www.themanordelhi.com). The Oberoi New Delhi. CLOSED for a complete overhaul till 2018. Tel: [91-11] 2436-3030, fax: 2436-0484, (e-mail: reservations@beroigroup.com or www.oberoidelhi.com). The Park New Delhi. Tel: [91-11] 2374-3000, fax: 2734-4000, (e-mail: resv.del@theparkhotels.com or newdelhi.theparkhotels.com). The Roseate New Delhi (formerly Dusit Devarana). Tel: [91-11] 3015-8656, (www.roseatehotels.com). The Suryaa New Delhi. Tel: [91-11] 2683-5070, fax: 2683-5071/4780-8080, (e-mail: res.mgr@thesuryaanewdelhi.com or www.thesuryaanewdelhi.com). Vivanta by Taj – Ambassador, New Delhi. Tel. [91-11] 6626-1000, fax: 2643-2252, (e-mail: vivanta.ambassador@tajhotels.com or www.vivantabytaj.com/Ambassador-New-Delhi/). The Claridges New Delhi. Tel: [91-11] 3955-5000, fax: 2301-0625, (e-mail: reservations@claridges.com or tcnd@claridges.com or www.claridges.com or www.claridges-hotels.com/delhi/). The Imperial. Tel: [91-11] 2334-1234, / 4150-1234, fax: 2334-2255, (e-mail: luxury@theimperialindia.com or www.theimperialindia.com). Ahuja Residency Golf Links. Tel. [91-11] 2462-2255, 2461-1027, 2462-3945, fax: 2464-9008, (e-mail: info@ahujaresidency.com or www.ahujaresidency.com). Amarya Haveli. Tel: [91-11] 4175-9268, fax: 4265-1106, (e-mail: bookinghaveli@amaryagroup.com or www.amaryagroup.com). b nineteen Hotel. Tel: [91-11] 4182-5500, fax: 4182-5511, mob:  98710-88629, (e-mail: reservations@bnineteen.com or info@bnineteen.com or www.bnineteen.com). bloomrooms hotel. Tel: [91-11] 412-25666, (e-mail: book@bloomrooms.com or www.bloomroomshotel.com/hotels-linkrd.php). Casa Delhi. Tel:  99714-25558, (e-mail: sudhir.casa@gmail.com or www.casaboutiquehotels.com). Colonel's Retreat. Mob:  99997-20024, 98117-40900, (e-mail: info@colonelsretreat.com or www.colonelsretreat.com). Connaught Hotel. Tel: [91-11] 2336-4225, 2374-2842, mobile:  88003-93939, fax: 2334-0757, (e-mail: enquiries@hotelconnaught.com or www.theconnaughtnewdelhi.com). Hotel Diplomat. Tel: [91-11] 2301-0204, 4605-0200, fax: 2301-8605, (e-mail: reservations@thehoteldiplomat.com or diplomat@nda.vsnl.net.in or www.thehoteldiplomat.com). Hotel MetroTower. Mob:  98710-08161, (e-mail: htlmetrotower@yahoo.co.in or htlamit@gmail.com or www.indiamart.com/hotelmetrotower/). Hotel Tara Palace. Tel: [91-11] 2327-6465, 2327-6466, 4156-9444, mob:  99583-97483, fax: [91-11] 2327-3555 (e-mail: contact@tarapalacedelhi.com or www.tarapalacedelhi.com). Jukaso Inn. Tel: [91-11] 2435-0308, 2435-0309, fax: 2435-4402, (e-mail: reservationdel@jukaso.co.in or jukaso@hotmail.com or www.jukasohotels.com). La Sagrita. Tel: [91-11] 4150-7013/4, 2435-3973, 2435-1249, mob:  99719-78004, fax: 2435-6956, (e-mail: reservation@lasagrita.com or lasagrita@gmail.com or www.lasagrita.com). Madhuban Inn. Tel. [91-11] 4985-4985, fax: 4985-4986, (e-mail: reservations.madhuban@pepperminthotels.com or www.pepperminthotels.com/hotel-newdelhi). Scarlette New Delhi (formerly Colaba House). Tel:  8826-010-278, (e-mail: reservations@scarlettenewdelhi.com or scarlettenewdelhi.com/). The Q Bed & Breakfast by QBA. Tel: [91-11] 4517-3333, (e-mail: qba@qba.co.in or www.qba.co.in). Andaz Delhi. 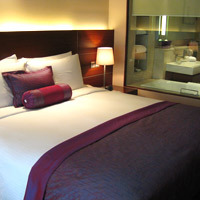 Tel: [91-11] 4903-1234, (delhi.andaz.hyatt.com/en/hotel/home.html). Ashok Country Resort New Delhi. Tel: [91-11] 2506-4590, fax: 2506-3054, (e-mail: acr@bol.net.in or www.ashokcountryresort.com). JW Marriott Hotel New Delhi Aerocity. Tel: [91-11] 4521-2121, fax: 4521-2122, (www.marriott.com/hotels/travel/delap-jw-marriott-hotel-new-delhi-aerocity). Radisson Blu Hotel Delhi. Tel: 91-11] 2677-9191, fax: 2677-9090, (e-mail: reservations@radissondel.com or www.radissonblu.com/hotel-newdelhi). Roseate House New Delhi. Tel: [91-11] 7155-8800, (www.roseatehotels.com). VITS Luxury Business Hotel. Tel: [91-120] 330-0755, mob:  88006-93456, (e-mail: salesdelhi@vitshotels.com or www.vitshotelsncr.com). Fortune Select Global Gurgaon. Tel: [91-124] 419-6666, fax: 406-2388, (e-mail: contactus@fortunehotels.in or www.fortunehotels.in). Hotel City Park, Airport. Tel: [91-11] 4232-0101, (www.cityparkhotels.com). Hotel Ibis Gurgaon. Tel: [91-124] 475-5111, fax: [91-124] 475-5222, (e-mail: H6363-RE@ACCOR.COM or www.ibishotel.com). 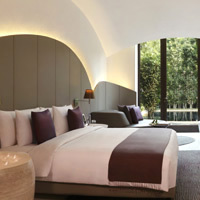 Hotel Pullman Gurgaon Central Park. Tel: [91-124] 256-5407, fax: [91-124] 2565-5407, (e-mail: H6544@accor.com or www.accorhotels.com). Lemon Tree Hotel, CityCenter. Tel: [91-124] 416-0303, fax: 416-0404, (e-mail: hi.cc@lemontreehotels.com or www.lemontreehotels.com). Lemon Tree Hotel, Udyog Vihar. Tel: [91-124] 442-3232, (e-mail: hi@lemontreehotels.com or www.lemontreehotels.com). Park Plaza Gurgaon. 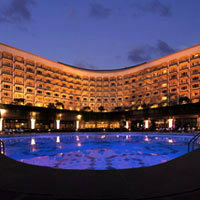 Tel: [91-124] 415-0000, fax: 410-0555, (e-mail: res@parkplazagurgaon.com or ppg@sarovarhotels.com or www.parkplaza.com). The Bristol. Tel. [91-124] 235-6030, 435-1111, fax: 405-4444, 235-7834, (e-mail: reservations@thebristolhotel.com or www.thebristolhotel.com). The Leela Gurgaon, Delhi. Tel: [91-124] 477-1234, fax: 477-1235, (e-mail: reservations.gurgaon-delhi@theleela.com or www.theleela.com). The Oberoi Gurgaon. Tel: [91-124] 245-1234, fax: 245-1235, (e-mail: oberoi.gurgaon@oberoihotels.com or www.oberoihotels.com). The Westin Gurgaon. Tel: [91-124] 497-7777, fax: 497-8000, (e-mail: gurgaon@westin.com or www.starwoodhotels.com/westin/). The Westin Sohna Gurgaon Resort & Spa. Tel: [91-124] 450-8888, fax: 450-8800, (e-mail: westin.sohna@westin.com or www.starwoodhotels.com/westin/). Trident Gurgaon. Tel: [91-124] 245-0505, fax: 245-0606, (e-mail: reservations.gurgaon@tridenthotels.com or www.tridenthotels.com).